GOLDEN EAGLE JAZZ BAND will play at the FARNBOROUGH JAZZ CLUB (Kent) tonight, Friday 1st June 2018. Band leader, KEVIN SCOTT, who plays tenor banjo & sings, has booked TONY KARAVIS on trumpet, ALAN CRESSWELL on reeds, plus ROY STOKES on trombone & vocals, CHRIS THOMPSON on double bass and MALC MURPHEY on drums. 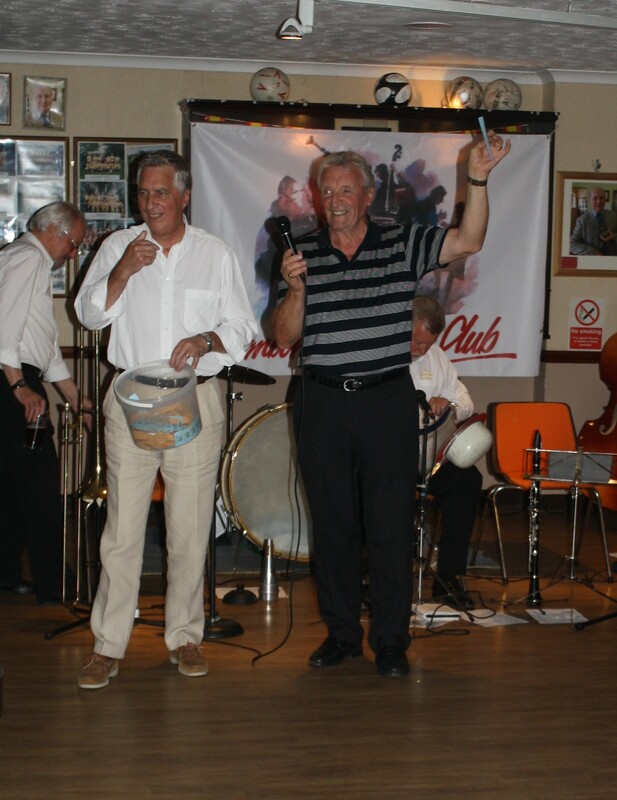 Keith and I are unable to be with you, so you will have a lot of fun with your hosts, John and Len (the two 007’s) – always ready to make the evening successful making sure everyone enjoys themselves, just like this band does. So be there and enjoy. This entry was posted in Golden Eagle Jazz Band on June 1, 2018 by Diane. 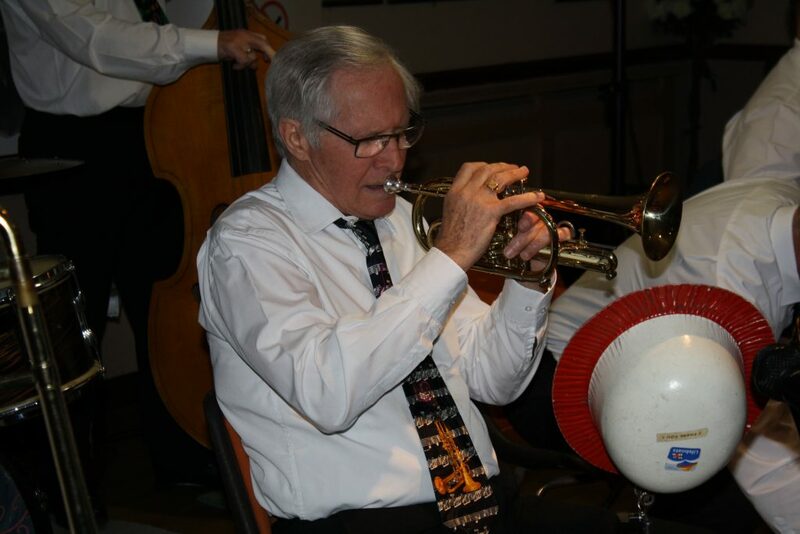 It’s EASTER GOOD FRIDAY, 30th March 2018 and we have a golden band for you – the GOLDEN EAGLE JAZZ BAND here at the FARNBOROUGH JAZZ CLUB (Kent) Band leader, KEVIN SCOTT, who plays tenor banjo, has booked TONY KARAVIS on trumpet, ALAN CRESSWELL on reeds, GEORGE ‘KID’ TIDIMAN on trombone & vocals, CHRIS THOMPSON on double bass and PETE LAY on drums. 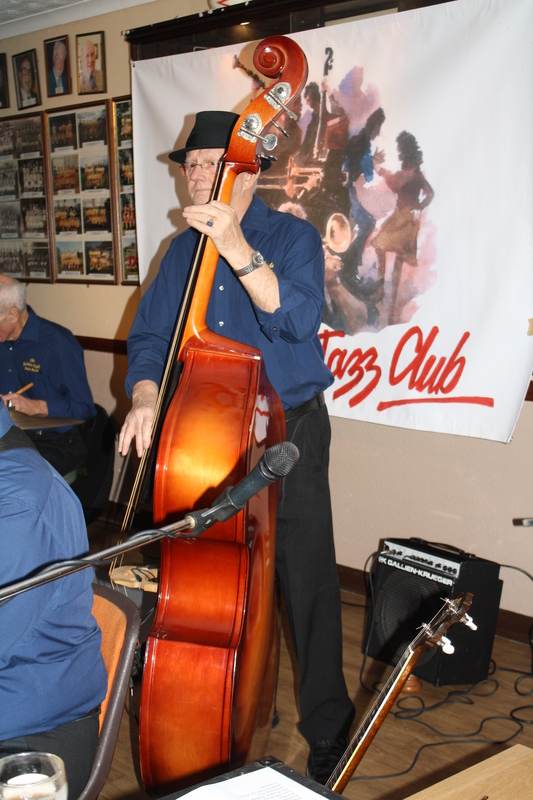 They play the best of New Orleans traditional jazz, with the right tempos for us dancers. Come and enjoy yourselves enjoy a drink and maybe win an Easter Egg for yourself (instead of the kids) in the raffle and start off your Easter holiday by winding down to some lovely fun music. This entry was posted in Golden Eagle Jazz Band on March 29, 2018 by Diane. Last Friday was such a cold night with snow expected, but you all turned out anyway and we enjoyed a great evening. Most of you hopefully got home before that snow, although when Johnny Baker, Ian, Keith and I left, it had laid and looked quite pretty. However, this week is much warmer and so this Friday, 17th February 2017 is sure to be even busier. Plus with the GOLDEN EAGLE JAZZ BAND being our band here (FARNBOROUGH JAZZ CLUB) too, you are sure to enjoy yourself again. Band leader, KEVIN SCOTT (tenor banjo) has booked the following guys, namely DAVE STRADWICK on trumpet, ALAN CRESSWELL on clarinet, ROY STOKES on trombone & vocals, MIKE BROAD on double bass and MIKE MURPHEY on drums & vocals. They always give us a good time, encouraging plenty of dancing to some lively good old fashioned New Orleans jazz, the way it should be played, plus with this lot, plenty of banter and jokes between them too. This entry was posted in Golden Eagle Jazz Band on February 17, 2017 by Diane. 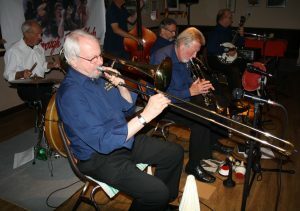 GOLDEN EAGLE JAZZ BAND started our New Year off with some great traditional jazz here at FARNBOROUGH JAZZ CLUB and did we have fun. Well, they are back to do the same on Friday, 17th June 2016. The band had the same line-up, namely band leader KEVIN SCOTT (tenor banjo), plus MIKE SCROXTON on trumpet, ALAN CRESSWELL on clarinet, ROY STOKES on trombone & vocals, MIKE BROAD on double bass and PETE JACKMAN on drums. 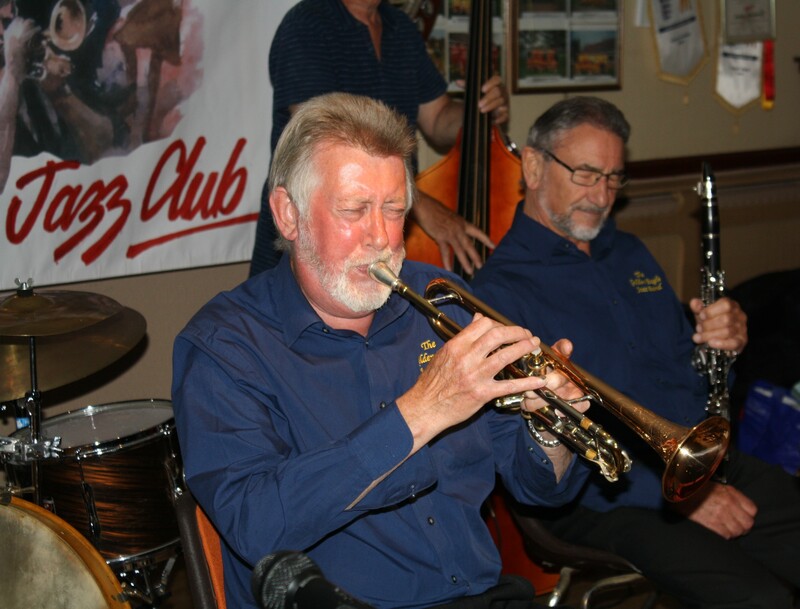 Golden Eagle Jazz Band play at Farnborough Jazz Club (Kent) on Friday, 17th June 2016. (LtoR) Roy Stokes (trombone), Pete Jackman (drums), Mike Scroxton (trumpet), Alan Cresswell (clarinet), Mike Broad (d.bass) and band leader Kevin Scott (tenor banjo). Photo by Mike Witt. I always say it is good to begin the evening with a good swinging number to really put the audience in a happy mood. Well they certainly gave a great start, obliging me with ‘Canal Street Blues’ and then followed up with ‘The Royal Telephone’ – remember Burl Ives? – lovely ol’ voice. Kevin’s lot play a much more jazzed up version, of course. 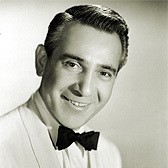 Jack Lawrence (b. April 7, 1912 – d. March 16, 2009) was an American songwriter. He was inducted into the Songwriters Hall of Fame in 1975. Their third number was another one of my old favourite tunes, ‘Ciriciribin’, (I’ve added the composer’s photo!). Kevin announced it as being a lovely old romantic tune. Up next, we enjoyed our line dance (again only five of us – well one more than last week, ha – we’ll probably have a few back next week from hols!). The number was ‘There’s Yes,! Yes! In Your Eyes’. Well, at least we had the rest of the dancers up dancing to my next number to mention – ‘The Glory Of Love’, (remember lovely Jimmy ‘Snozzle’ Durante?). Here’s Alan Cresswell playing clarinet, accompanied by smiley Kevin Scott with his Golden Eagle Jazz Band at Farnborough Jazz Club (Kent) on 17th June 2016. Photo by Mike Witt. The Golden Eagle Jazz Band’s trumpeter, Mike Scroxton plays whilst clarinetist, Allan Cresswell listens, at Farnborough Jazz Club (Kent) on Friday, 17th June 2016. Photo by Mike Witt. Golden Eagle Jazz Band at Farnborough Jazz Band (Kent) on Friday, 17th June 2016. 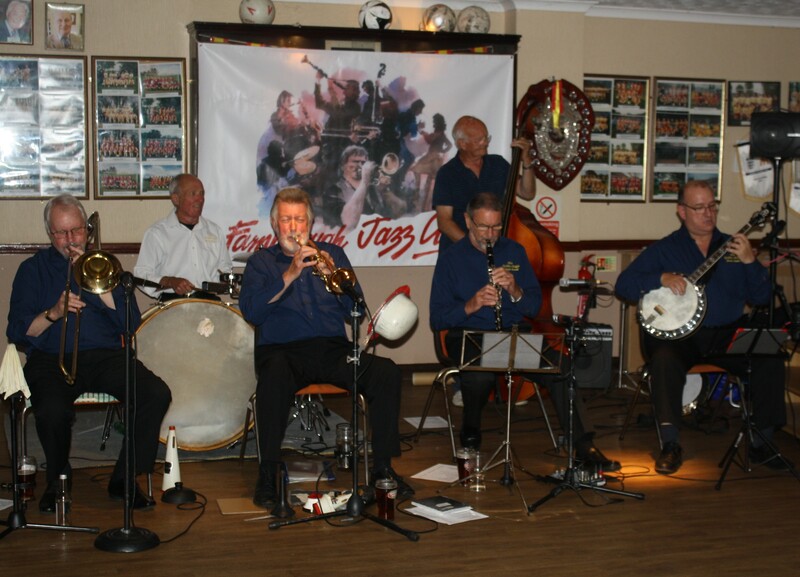 (LtoR) Pete Jackman (drums), Roy Stokes (trombone), Mike Broad (double bass) sorry he’s hidden), Mike Scroxton (trumpet), Alan Cresswell (clarinet) and band leader Kevin Scott (tenor banjo). Photo by Mike Witt. Then a great trad’ dancing number came in the shape of ‘Milenurg Joys’. Oh yes, they showed they just loved playing it too – what a beat. 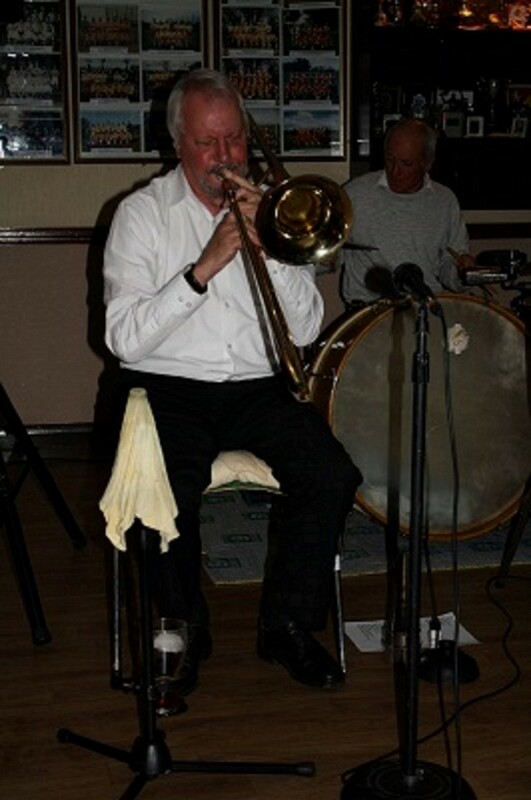 Marvelous trombone playing by Roy with Alan (always wonderful clarinet tones. I would like to make particular mention to, Mike (S) performing brilliantly on trumpet to their next tune – ‘My Old Kentucky Home’. Another brilliant situation followed (I must mention) and that is about the boys playing their next number to a packed dance floor, with all the dancers singing at the top of their voices. The tune was ‘Over In The Glory Land’ – certainly a lot of fun. My next choice to mention, being a Latin American flavor, is ‘Jambala’ and was sung by Kevin, you can tell I love the lively numbers. 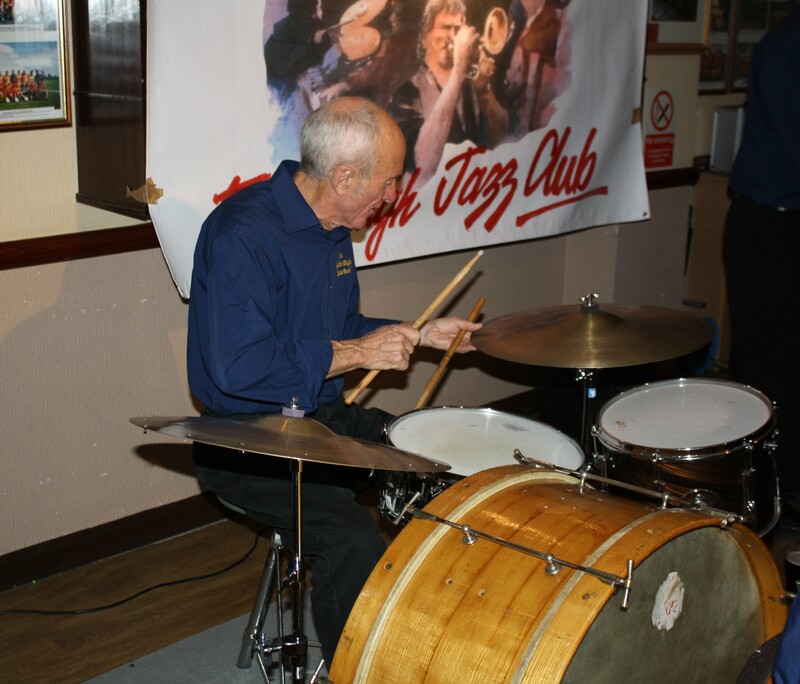 Pete Jackman plays drums for Golden Eagle Jazz Band at Farnborough Jaz Club (Kent) on Friday 17th June 2016. Photo by Mike Witt. How about ‘Just A Closer Walk With Thee’? 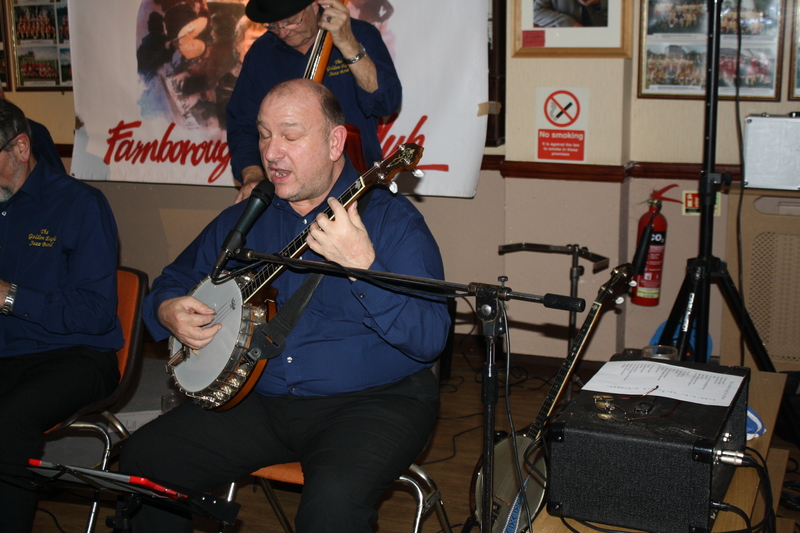 It was performed as a great duo only by Mike (B) and Pete (double bass and drums) – wonderful, very enjoyable. Mike Broad plays double bass for Golden Eagle Jazz Band at Farnborough Jazz Club (Kent) on Friday 17th June 2016. Photo by Mike Witt. I’ll close my newsletter and mention ‘Walking With The King’, with Kevin singing, he does sing so well. The band’s booking had been specially requested for Judy’s 70th birthday and we all enjoyed it with her too. Thank you boys for giving her and us a good time. They will be back 25th November. This entry was posted in Golden Eagle Jazz Band on June 21, 2016 by Diane. First, let us wish you all a happy New Year. 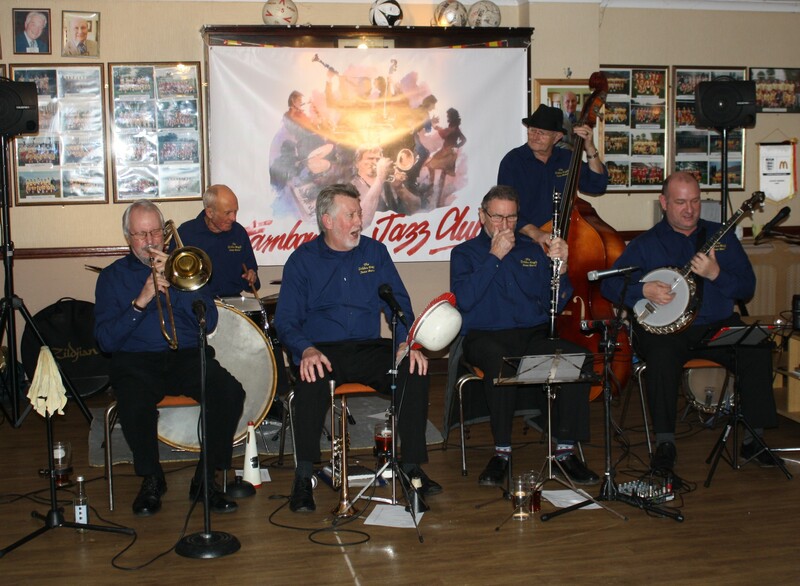 The GOLDEN EAGLE JAZZ BAND had started our New Year off with some great traditional jazz here at FARNBOROUGH JAZZ CLUB on Friday, 8th January 2016. The band, leader, KEVIN SCOTT, who plays tenor banjo & vocals, had with him MIKE SCROXTON on trumpet, ALAN CRESSWELL on clarinet, ROY STOKES on trombone & vocals, MIKE BROAD on double bass and PETE JACKMAN on drums. 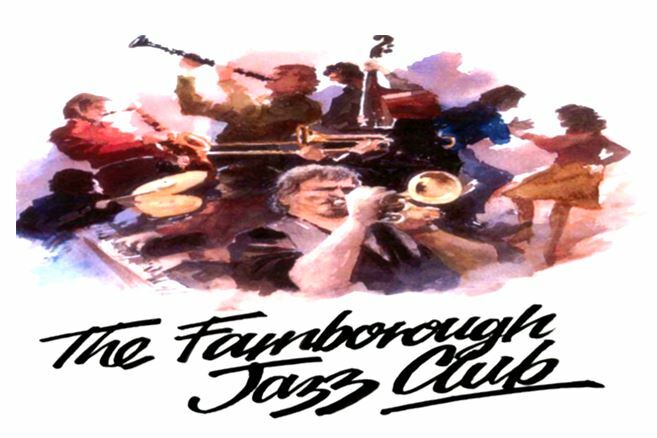 Golden Eagle Jazz Band at Farnborough Jazz Club (Kent) on 8th January 2016. 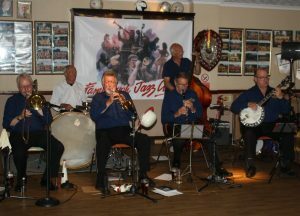 (LtoR) Roy Stokes (trombone&vocs), Pete Jackman (drums), Mike Scroxton (trumpet), Alan Cresswell (clarinet), Mike Broad (double bass) and Band leader Kevin Scott (tenor banjo). Photo by Mike Witt. I suggested that with all the festive season’s eating you surely had tucked away, you would most likely be in need of dancing off all those pounds, being the best way to exercise. Plus after all those repeat TV programs, you must have been in great need of cheering up, so to come and enjoy the music. Of course some of you were away, but thanks to a nucleus of punters, others turned up. I know I always mention about this band, being full of fun, but it’s so true. All bands arrive long before everyone, to prepare and it is a great treat for me, listening to all the banter that goes on. The jokes, fun and laughter between this particular band was a wonderful way for me to start the New Year, leaving me with tears of laughter in my eyes and I knew they were going to be on good form for our audience and they certainly were. They began with their first number ‘Exactly Like You’, followed with ‘Shine’. Both lovely numbers and ‘Algiers Stomp’ had us up dancing our line-dance, which all us participants enjoy. Mike played a brilliant bit of trumpet, when they played ‘Postman’s Lament’ (I think it was sung by Kevin). Kevin also sang ‘I’ll See You In My Dreams’, singing it beautifully. ‘Lord, Lord, Lord, You Sure Been Good to Me’ was then sung by Roy – amazing how so many musicians are fabulous singers, you’d think they were just proficient playing their musical instruments only, but not so. 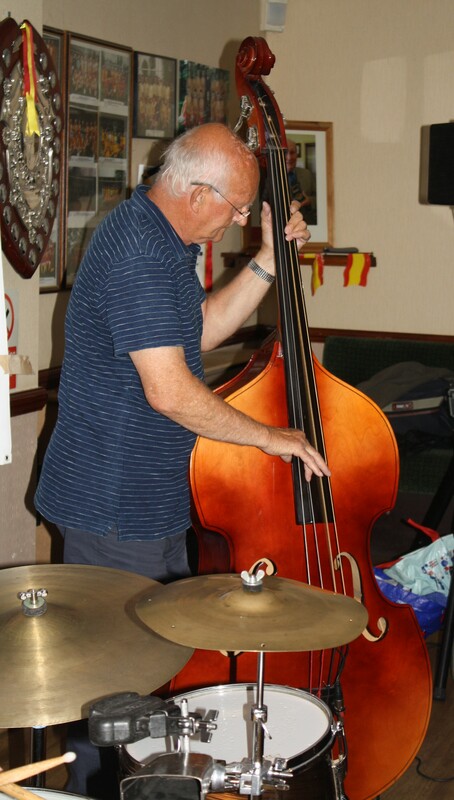 Mike Broad plays double bass for Golden Eagle Jazz Band at Farnborough Jazz Club (Kent) on 8th January 2016. Photo by Mike Witt. Pete Jackman plays drums for Golden Eagle Jazz Band here at Farnborough Jazz Club (Kent) on 8th January 2016. Photo by Mike Witt. 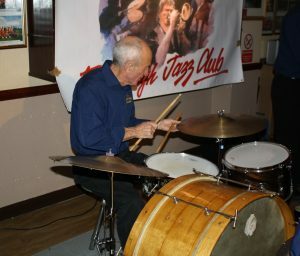 Anyway, Alan was featured next with ‘Wild Cat Blues’, (backed by both Mike (B) and Pete), what an applause he got too. ‘Sweet Sue’ was another number played with super brilliance by all of them, as with ‘Walking With The King’, which was sung by Roy. 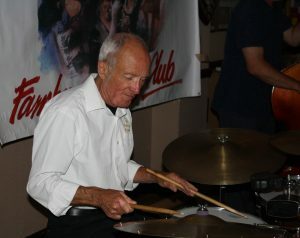 What a great job he does too and quite a good favourite with all the jazzers. Oh, you must read my write-up back on 11th September 2013, about the next number ‘Collegiate’, such a story I managed to dig up. 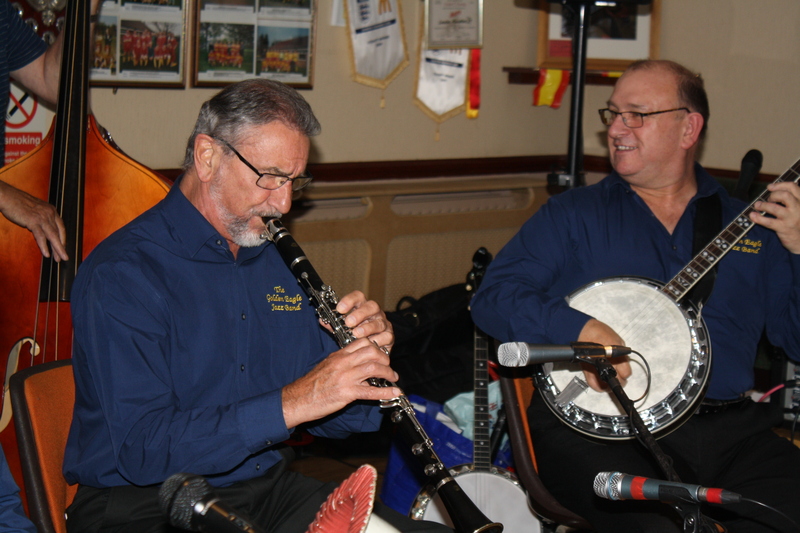 They played it brilliantly and finished the evening off with such smiles from both musicians and audience alike. Looking forward to having them back on 17th June next. This entry was posted in Golden Eagle Jazz Band on January 10, 2016 by Diane.